Motto: "King of Kings, Regnant of Regnants"
The Palaiologos dynasty (pl. Palaiologoi; Greek: Παλαιολόγος, -οι), also romanized as Palaeologus or Palaeologue, was the name of a Byzantine Greek family, which rose to nobility and ultimately produced the last ruling dynasty of the Byzantine Empire. Founded by the 11th-century general Nikephoros Palaiologos and his son George, the family rose to the highest aristocratic circles through its marriage into the Doukas and Komnenos dynasties. After the Fourth Crusade, members of the family fled to the neighboring Empire of Nicaea, where Michael VIII Palaiologos became co-emperor in 1259, recaptured Constantinople and was crowned sole emperor of the Byzantine Empire in 1261. His descendants ruled the empire until the Fall of Constantinople at the hands of the Ottoman Turks on May 29, 1453, becoming the longest-lived dynasty in Byzantine history; some continued to be prominent in Ottoman society long afterwards. A branch of the Palaiologos became the feudal lords of Montferrat, Italy. This inheritance was eventually incorporated by marriage to the Gonzaga family, rulers of the Duchy of Mantua, who are descendants of the Palaiologoi of Montferrat. The origins of the Palaiologoi (lit. "old word", sometimes glossed as "ragman" or "antique collector") are unknown. Later traditions sometimes tied them to the Italian city of Viterbo (the Latin vetus verbus having the same meaning as the family's name) or to the Romans who immigrated east with Constantine the Great during the founding of his new capital. Both were probably fabrications created to help legitimize the dynasty. The family are first attested as local lords in Asia Minor, particularly Anatolikon, with Nikephoros Palaiologos rising to command over Mesopotamia under Michael VII Doukas. He supported the revolt of Nikephoros Botaneiates, while his son George married Anna Doukaina and therefore supported his sister-in-law's husband Alexios Komnenos during his rise to power. As commander (doux) of Dyrrhachium, George faced the Norman Duke Robert Guiscard in an 1081 battle. The Palaiologoi held military offices and further united their family to the Doukai and Komnenoi during the 12th century. They followed Theodore Laskaris to Nicaea and began to assume high-ranking political offices as well. Alexios Palaiologos, whose wife was a granddaughter of Zoe Doukaina (youngest daughter of Constantine X Doukas) and her husband Adrianos Komnenos (younger brother of Emperor Alexios I). Another Alexios Palaiologos married Irene Angelina, eldest daughter of Alexios III Angelos and Euphrosyne Doukaina Kamatera. The latter couple's daughter Theodora Palaiologina married her cousin Andronikos Palaiologos, who was descended from Zoe. The couple were the progenitors of the imperial dynasty. Their son was Emperor Michael VIII Palaiologos (1223–1282). Michael VIII's son Andronikos II Palaiologos (1259–1332) married Anne of Hungary and fathered Michael Palaiologos (1277–1320), sometimes numbered the ninth. Michael IX married Rita of Armenia. Their son, the grandson of Andronikos II, was Andronikos III Palaiologos (1297–1341). Andronikos III married Anna of Savoy. Their son was John V Palaiologos (1332–1391). John V married Helena Kantakouzene, a daughter of his co-ruler John VI Kantakuzenos. Their sons included Andronikos IV Palaiologos (1348–1385) and Manuel II Palaiologos (1350–1425). Manuel II married Helena Dragaš. They were the parents of John VIII Palaiologos (1392–1448) and Constantine XI Palaiologos (1404–1453), the last Byzantine emperor, as well as the despots of Morea Demetrios Palaiologos (1407–1470) and Thomas Palaiologos (1409–1465). Demetrios, after giving Mehmed II a pretext to invade Morea, was kept from his throne and remained in captivity. His daughter Helen was a member of the sultan's harem for a time. Thomas, in exile in Venice, sold the imperial title to Charles VIII of France, who however never used it for formal purposes. The double-headed eagle was adopted as a symbol for high-ranking members of the imperial family (including the Emperor), during the Palaiologos dynasty period. Thomas' daughter Zoe (died 1503) married Ivan III of Russia and, on rejoining the Orthodox faith, returned to her earlier name Sophia. Her influence on the court curtailed the power of the boyars and eventually led to the proclamation of the Grand Prince of Muscovy as the Tsar of all the Russias. Though Thomas's male-line descendants soon became extinct, his descent lives on through a daughter and the family of Castriota Dukes of san Pietro di Galatina in south-Italian aristocracy. One such female descendant, Princess d'Arenberg, married at the beginning of the 19th century a Pfalzgraf of Zweibrücken, whereby the Dukes of Bavaria descend from Byzantine emperors. Also Queen Anne, consort of former king Michael of Romania descends from these Arenbergs, thus being a descendant of Byzantine emperors of Constantinople. Reportedly Herina, the first wife of Emperor Isaac II Angelos who reigned from 1185 to 1195, was of the Palaiologos family. A younger son of Andronikos II became lord of Montferrat as heir of his mother. His feudal dynasty ruled in Montferrat, longer than the imperial branch did in Constantinople. This inheritance was eventually incorporated by marriage to the Gonzaga family, rulers of the Duchy of Mantua, who descend from the Palaiologoi of Montferrat. Later, that succession passed to the Dukes of Lorraine, whose later head became the progenitor of the Habsburg-Lorraine emperors of Austria. The Paleologo-Oriundi, an extant line, descends from Flaminio, an illegitimate son of the last Palaiologos marquess John George. The reconstituted realm was very weak compared with the pre-1204 Empire. The Palaiologoi emperors were not granted the earlier luxury of isolation. Imperial marriages became increasingly mercenary and royal princesses regarded as little more than merchandise. The future Michael VIII married Theodora Doukaina Vatatzina, a kinswoman of the Batatzes Lascaris family, in order to solidify his position in the Nicean Empire. Michael VIII's sister, Andronikos and Theodora's daughter Irene Palaiologina, was the mother of Maria Kantakuzenos, who married Constantine Tikh and Ivailo of Bulgaria in turn. Michael VIII was the father of Constantine, who in turn fathered John, who became the father-in-law of Stefan Dečanski of Serbia. Michael's daughter Irene married Ivan Asen III of Bulgaria, and another daughter, Eudokia Palaiologina, married John II Komnenos of Trebizond, and another daughter, Theodora, married David VI of Georgia. Andronikos II Palaiologos married Anna of Hungary, daughter of Stephen V of Hungary and Elizabeth the Cuman. They were parents of Michael IX Palaiologos, who predeceased his father but was a co-regent, as such sometimes numbered the ninth. This Michael married Rita of Armenia, a princess of Cilician Armenia as daughter of Leo III of Armenia and Queen Keran of Armenia. His son, the grandson of Andronikos II, was Andronikos III Palaiologos. Michael's daughter Theodora Palaiologina married Theodore Svetoslav and Michael Shishman, rulers of Bulgaria, in turn. A daughter Anna Palaiologina married first Thomas I Komnenos Doukas, Ruler of Epirus and then his successor Nicholas Orsini, already count of Kefalonia. By his second wife, Irene of Montferrat, Andronikos II had Simonis, later the wife of Stefan Milutin of Serbia. His son, Theodore I, Marquess of Montferrat, became lord of Montferrat as heir of his mother. Theodore' inheritance was eventually incorporated by marriage to the Gonzaga family, rulers of the Duchy of Mantua. Andronikos III married firstly Irene of Brunswick, who died without surviving issue, and secondly Anna of Savoy who was descended from Baldwin I of Constantinople. They were the parents of John V Palaiologos. John V was compelled to marry Helena Kantakouzene, a daughter of John VI Kantakouzenos. In order to obtain support to remove John VI, John V gave his sister Maria to Francesco I Gattilusio, who received the Duchy of Lesbos, an island which remained under the control of the Genoese until 1462. They founded the noble family who continued into Italian Genoese aristocracy, being ancestors of the princes of Monaco. Andronikos IV Palaiologos married Keratsa of Bulgaria. She was a daughter of Ivan Alexander of Bulgaria. Manuel II Palaiologos married Helena Dragaš, daughter of Constantine Dragaš who was a regional lord of the dissolved Serbian realm. Demetrios Palaiologos's daughter Helen was a member of the harem of Mehmed II for a period of time. Thomas Palaiologos' daughter Zoe married Ivan III of Russia. In 1446, Zoe's elder sister Helena Palaiologina was married to Lazar Branković, a Serbian prince. Their descendants continued for some time in the Balkans. Thomas's male-line descendants shortly became extinct. Under the rule of the Palaiologoi (1261 - 1453), the fragmented Byzantine Empire still considered themselves to be the Roman Empire, but began to focus more on the empire's Greek heritage. The word "Hellene" began to be used again to describe themselves, after having been a synonym for "pagan" for many centuries. The dynasty was a patron of literature and the arts; among others, George Gemistos Plethon came to prominence. The hesychasm controversy also took place during the rule of the Palaiologoi dynasty. At the later days of their empire the Peloponnese was the largest and wealthiest part of the empire, and was ruled as the Despotate of Morea by members of the Palaiologos family, often two or three younger brothers simultaneously. Although they often squabbled amongst themselves they were usually fiercely loyal to the emperor in Constantinople (though sometimes they sought to supplant the emperor and rise to the throne), while their land was surrounded by hostile Venetians and Turks. The capital of the despotate was Mystras, a large fortress built by the Palaiologoi near Sparta. The Palaiologoi frequently attempted to reunite the Eastern Orthodox Church with the Roman Catholic Church, hoping this would lead the West to give them aid against the Turks. Every attempt at reunification was strongly opposed by the general population. The family had connections throughout Europe. They married into the Bulgarian, Georgian and Serbian royal families, as well as the noble families of Trebizond, Epirus, the Republic of Genoa, Montferrat, and Muscovy. Some of the dynasty remained (and prospered, to an extent) in Constantinople long after the Ottoman conquest; 15th- and 16th-century Ottoman documents identify tax-farmers and merchants called Comnenus bin Palaeologus, Yorgi bin Palaeologus, and Manuel Palaeologus. 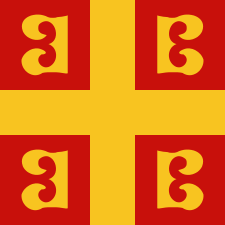 Flag with the emblem of the Palaiologos dynasty, the tetragrammic cross. The four Bs, or pyrekvola, represent the initials of the family's motto. Stylized depiction (based on the modern-day flag of the Greek Orthodox Church) of the double-headed eagle with the dynastic cypher of the Palaiologoi. The eagle was used to represent the emperor, as well as higher-ranking members of the imperial family in general. Variant flag from the Libro del Conoscimiento (c. 1350) for the "Empire of Constantinople", featuring St. George's Cross (likely representing Genoa) alongside the tetragrammic cross. The "tetragrammic cross" emblem of the Palaiologos dynasty was used under the Palaiologoi to represent the Empire, as attested in several sources of the 14th and 15th centuries. It is a cross between four firesteels (Greek: πυρέκβολα), each representing the letter B (beta). The firesteels have been interpreted as the initials of the imperial motto Βασιλεὺς Βασιλέων Βασιλεύων Βασιλευόντων (Basileus Basileon Basileuon Basileuonton) or Βασιλεὺς Βασιλέων Βασιλεύων Βασιλεῦσι (Basileus Basileon Basileuon Basileusi), translated as "king of kings, ruling over rulers". Another common emblem used by the Palaiologoi to represent the Emperor and high-ranking members of the Imperial family, was the double-headed eagle, occasionally displayed bearing the family's sympilema, or dynastic cypher, on the breast. This is the only recorded instance of the double-headed eagle in actual imperial use. ↑ Edward Gibbon (1862). Gibbon's History of the decline and fall of the Roman Empire. Volume 5. Longman, Rees, Orme, Brown and Green. Retrieved 24 June 2011. ↑ Gill, Joseph (1980). "Family feuds in fourteenth century Byzantium: Palaeologi and Cantacuzeni". Conspectus of History. 1 (5): 64. ↑ Kazhdan, A. "Palaiologos" in the Oxford Dictionary of Byzantium, Vol. III, p. 1557. Oxford University Press (Oxford), 1991. 1 2 3 Vannier, J.-F. "Les premiers Paléologues. Étude généalogique et prosopographique" in J.-C. Cheynet's Études prosopographiques, pp. 129 ff. (Paris), 1986. 1 2 3 4 "Palaeologan Dynasty (1259-1453)" in the Encyclopaedia of the Hellenic World: Asia Minor. Foundation of the Hellenic World, 2008. Accessed 15 Oct 2014. ↑ "I Paleologi di Monferrato dopo il 1533" (PDF). www.marchesimonferrato.com. ↑ Vryonis, Speros (1969). "The Byzantine Legacy and Ottoman Forms". Dumbarton Oaks Papers. 23/24: 251–308. Marek, Miroslav. "Genealogy of the Palaiologos dynasty from Genealogy.eu". Genealogy.EU.